The period of swift-striking, highly-motorized warfare was not yet at an end. After the Montelimar grip had been loosened, the 36th streaked northward 80 miles in three days toward Lyons, largest silk-manufacturing center in the world and the second city of industrial importance in France. Reconnaissance elements led the regiments to the east of the city, instructions limiting entrance only to liaison parties contacting the Maqui within. On September 2 the 142nd and 143rd closed in on Lyons proper. During the afternoon, Gen. Dahlquist ordered a patrol to scout the town. The patrol reported that the Maqui had cleared the Germans from the areas before the bridge sites of the Rhone river, running through the heart of the city. How many spans remained intact could not be determined at first, but our troops, later sent in to secure the sites, discovered that the enemy had blown every bridge across the Rhone within Lyons. As the Division established roadblocks east and northeast of Lyons, bridge reconnaissance parties from the 111th Engineer Battalion made their way into the city after being delayed by one skirmish. A heated clash was in progress on the west side of the Rhone between the Maqui and the Milice, Vichy police despised by the French Patriots. One whole section of the city, the industrial area, was their battleground. 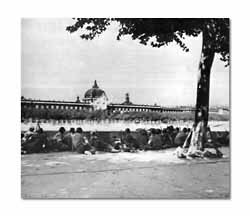 But on the near side of the river our patrols were greeted by thronging groups of civilians who came out to applaud their liberation. The elderly shook hands and threw flowers; the young sought autographs and climbed aboard jeeps and trucks. That evening Gen. Gahlquist placed a guard of honor at the disposal of the mayor at the town hall. Initially, it appeared as though Lyons might have to undergo a lengthy siege, but on September 3 it became apparent that the Germans were withdrawing. 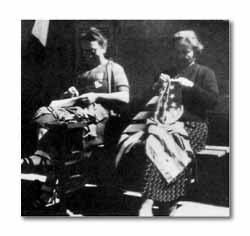 In several of the factories fires still raged; in some districts the Milice continued to resist extermination. The Maqui were left to the mop-up mission while the 36th moved out, making a 30-mile detour eastward to cross the Rhone and catch the enemy before he reached his prepared defenses. 36th Division men, partisons, and armed civilians fire back at German snipers across the Rhone River. The French women made American flags. 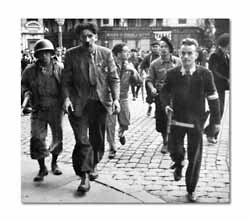 A member of hated Vichy Milice, who battled with the FFI and the Americans, is captured and led away.